We will learn (beginners) or check and practise (intermediates) a correct bodhran holding position and few techniques of playing this amazing instrument. We will go through the basic rhythms used in traditional Irish music and develop it. If the time lets us, we will cross the border of Ireland and try some world music rhythms as well. Patrycja is a percussionist associated with Polish scene of Ethno performers such as Shannon, Same Suki, Kayah & Transoriental Orchestra, Sam Yoon, Hoboud, Pompadur. For nearly two decades, she has also been playing in bands such as Balkan Sevdah, Danar, Karpatia, Kayanis, Maayan, Pako Sarr. Generally Patrycja navigates fluently in genres such as: ethno, world, ethno – pop, folk, folklore, acting song, entertainment music, etc . In her achievements you can hear a wide range of percussion instruments such as: Bodhrán – typical of Irish culture, instruments related to the Middle East culture (Bendir, Duff, Doumbek etc . ), Peruvian Cajon, Nigerian Udu or Tapan deriving from the Balkan countries and many others. Since the end of 2011 Patrycja has been the official Robert Forkner’s bodhrans endorser, as the only woman and one of the two non-Irish origin bodhranists who possesses their own signature line. Since 2015 she has been an official endorser of a polish cajons – AW Cajon by Andrzej Wlodarczyk. Since 2017 she has been an official endorser of polish frame drums – Jacek Żelazek drums. Patrycja doeas a great work as a teacher. She organises individual and group drumming workshops for children, teenagers and adults. She has a broad experience in leading music auditions in educational institutions, workshops during picnics, city days, events for companies and many other cultural events. This class is designed for beginner and advanced beginner players. The class is desgined for those are not playing or practising on a regular basis or they just want to start learning this percussive instrument. This class is for those players only who are practising bodhran on a regular basis and are ready to deepen their knowledge about the instrument. This class requires to know the correct holding of the instrument and be comfortable with basic rhythm patterns on the instrument. Do you have any additional bodhran that you could bring for the beginner students? 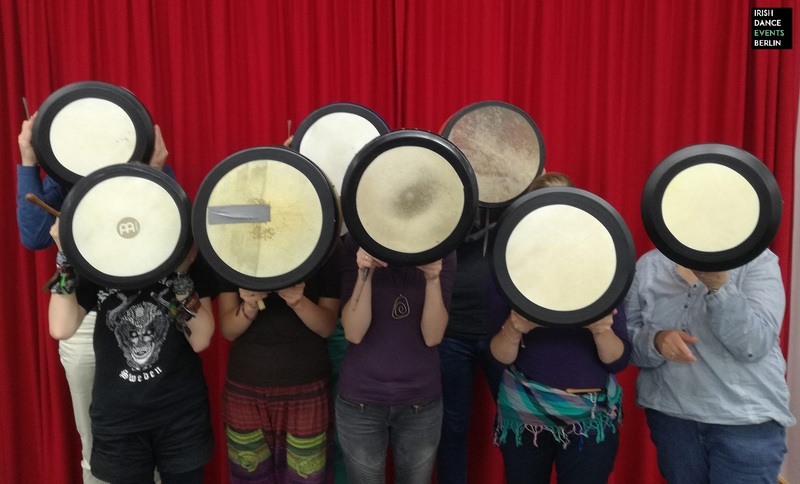 This class is designed for those who would like to try this percussive instrument for the first time or they have had their first experiences with it, but not practicing it on a regular basis. 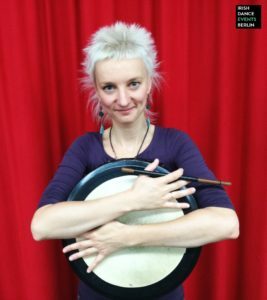 This class is designed for those who are practising bodhran on a regular basis, maybe even playing at sessions from time to time and they would like to dig into the details of it. After the first day we will go over to the Finnegan´s Irish Pub (Bergstr. 8, 12169 Berlin) for some refreshments and playing together.